KATHMANDU, Nepal -- An overcrowded bus carrying villagers heading home for the country’s biggest festival slipped off a mountain road in Nepal on Tuesday, killing at least 18 people, officials said. The bus was carrying passengers both inside and on the roof, said Dhading District Administration official Toran Parajuli. He said that the road was covered in parts by mud from landslides, and that the bus driver appeared to be trying to negotiate around these areas when the accident happened. Ramesh Dhamala, who was coordinating rescue efforts, said the left wheel of the bus slipped off the road and pulled down the whole vehicle. The bus slipped off the road near Lapang Phedi village, 75 miles west of Kathmandu, the capital, and rolled about 980 feet before stopping on the banks of the Ankhu River. Police and army rescuers along with local villagers helped the victims. 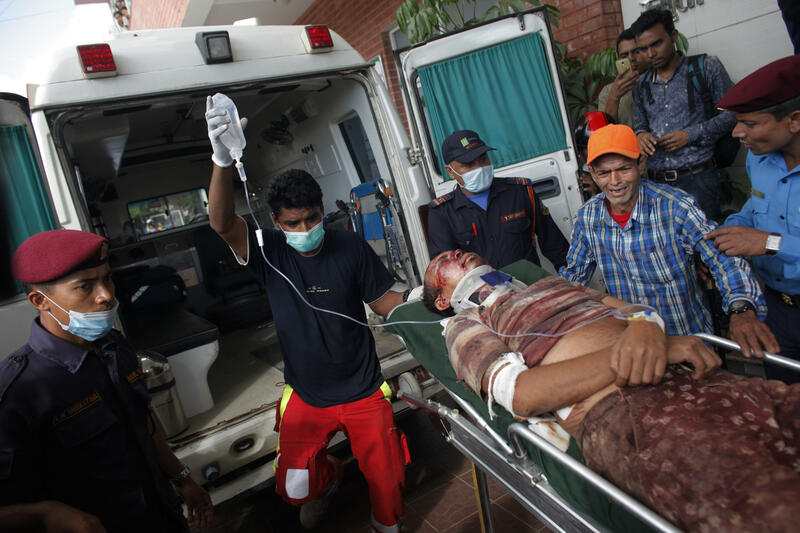 Two rescue helicopters sent from Kathmandu brought 13 injured people to a hospital. The bus, which was on a local route and carrying all Nepali nationals, was unusually crowded because people in Nepal are heading to their village homes this week for the Hindu festival of Dashain, which begins Saturday. The two-week festival is the most important one in Nepal, a predominantly Hindu country. It is illegal to travel on the roof of a bus in Nepal, but police do not monitor rural roads. Traffic accidents in the Himalayan country are blamed mainly on poorly maintained roads and vehicles.